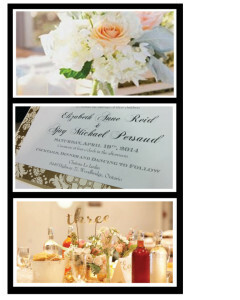 Top Drawer Weddings & Events has exciting things brewing for April! Elizabeth and Michael are tying the knot in Vaughan this Easter weekend and we are helping them plan their special day! With the ceremony and reception being held at the beautiful Chateau Le Jardin and photography taking place in Kleinberg, their wedding is sure to be a spectacular event. Cream, Gold and Black with hints of Peach – how romantic! There’s lots more crafting and planning to do though, so stay tuned to see how this amazing couple’s wedding looks!